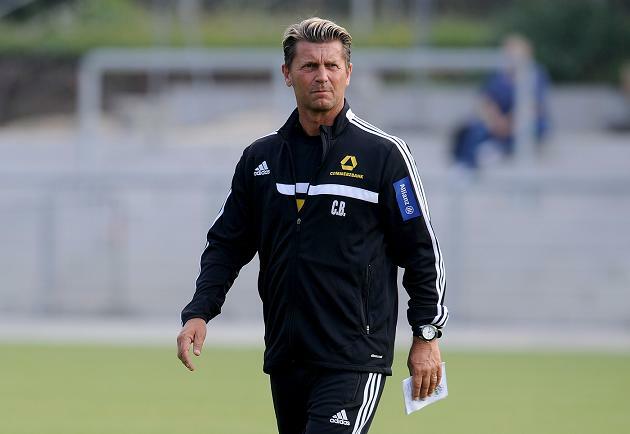 After over three decades in Germany as both a player and coach, the lights have faded to black on Englishman Colin Bell’s time at UEFA Women’s Champions League winners 1.FFC Frankfurt to usher in the next act with Norway’s Avaldsnes IL, and it gives the former Leicester City youngster a platform for new narratives in a truly varied tale of football, music and life. In the women’s game, the crusade for a level of respect, support and opportunity in keeping with the dedication and sacrifices expended by those at the heart of it is nothing new. Those in the dismissive and closed-minded camp tend to think of it as less deserving in those regards than men’s football, with the inability to see them as the same sport in one sense, but with vastly different dynamics to take into account and appreciate. As those who follow the women’s game closely will confirm, the standard of athleticism and technical ability at the top level is considerable, with some of the outstanding examples of play also now getting showcased to huge audiences via social media and the like. There have been a number of people with a background in men’s football who have gone on to cross into work within the women’s game, and experienced Leicester-born coach Colin Bell did just that in 2011. The former defender began his playing career at Leicester City before moving to VfL Hamm at the age of 20 in 1982, and Germany would certainly become his adopted homeland. Moving into coaching seven years later, his journey has since included working under Liverpool manager Jürgen Klopp at Mainz, coaching a young Lukas Podolski at Köln, managing Dynamo Dresden, and winning the UEFA Women’s Champions League last year with Frankfurt. With that latter triumph he became the first English coach to claim a Champions League crown, so even with Frankfurt’s fight to adapt since the close-season exit of Spanish creative star Vero Boquete and early retirement of striking sensation Célia Šašić, there were certainly some caught off-guard with the December news of his departure. As part of the announcement it was revealed that he was headed for ambitious Norwegian Toppserien runners-up Avaldsnes IL, and Colin explains his feelings at moving on after over two years with the club and an incredible 33 in Germany. “It has been a long-time dream of mine to work in another country after being so long now in Germany. Norway is a beautiful and interesting place, and also women’s soccer is very popular. “Avaldsnes is an up-and-coming club and will play Champions League next season. Frankfurt was for me a dream come true; to work with top-class players and to win two major titles. 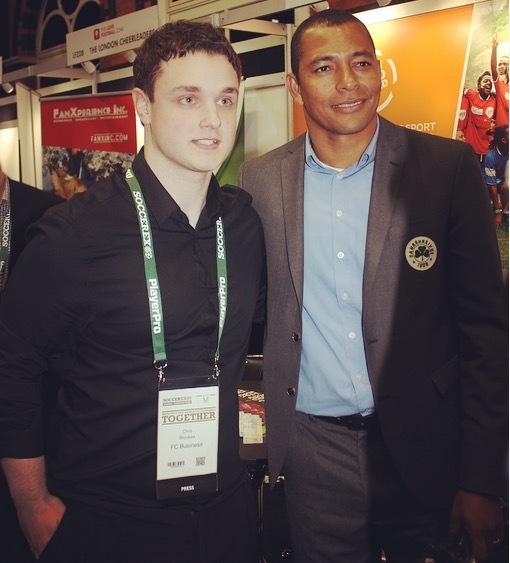 Firmly in the category of the game’s intriguingly unique personalities, delving into Colin’s coaching ideals while also learning of the interests that go alongside his lifelong football love makes for extremely engaging conversation. A deep affection for music is one example, and it has overlapped with the places football has taken him and the people who have been along for the journey. “Music’s a fantastic part of my life. It enables you to show and experience all sorts of emotions and it reminds you of people and loved ones who are no longer there. “It lets you live your emotions and it brings people together. My biggest favourite (artist) is a mate of mine, Gary Numan. “We met in Germany and we’ve been mates since 1998. I love Rammstein, and also Heldmaschine, whose guitarist is actually my guitar teacher. Along with his coaching path, Colin had also scouted heavily by the time he made a decision in 2011 which proved pivotal in determining where he is today. 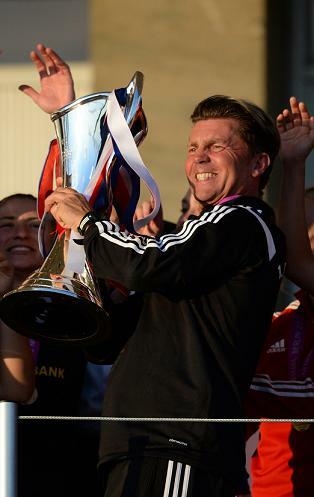 Having been so impressed by what he saw from two-time European champions Turbine Potsdam, he realised the possibility there was in the women’s game and accepted the head coaching position at another top-flight German side, SC 07 Bad Neuenahr. Keeping them up in his first season with a 7th-place finish, he had guided the team to the same position in 2012/13, only for financial troubles to see Bad Neuenahr relegated. 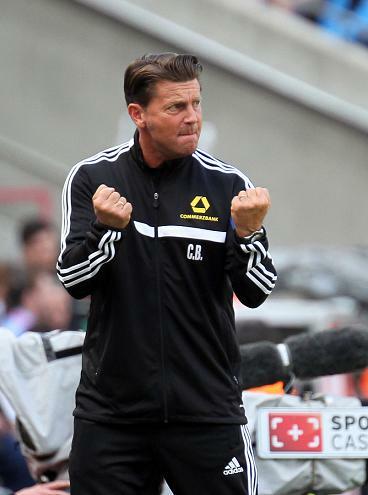 In his debut campaign at Frankfurt, Colin delivered domestic cup success with a 3-0 win over SGS Essen in Cologne. Wolfsburg were Champions League winners that season and also dramatically – and heartbreakingly for Colin and those on his side – snatched the Frauen-Bundesliga title with a last-day win against Frankfurt. It was their first league defeat of the season and a harsh lesson that took time to process, but it would be Frankfurt who claimed the continent’s top prize a year later. Their Champions League campaign had taken in trips to Kazakhstan, Italy and Denmark, as well as a homecoming for Colin with the quarter-final meeting at Bristol Academy, before the final with Paris Saint-Germain in Berlin. On May 14th 2015 in the German capital’s Friedrich-Ludwig-Jahn-Sportpark, over 17,000 saw Célia Šašić’s opener cancelled out by Marie-Laure Delie’s leveller for PSG, before Mandy Islacker buried the winner for Frankfurt in stoppage time. It was an incredible culmination of that group’s efforts over the season and it meant Colin became the first English coach to lead a side to a Champions League title, in either the men’s or women’s game. As we will discuss, he takes understanding the circumstances and personalities of his players seriously and it is an approach that has reaped rewards in getting his teams working as one. Away from the match analysis sessions, tactics boards and suchlike, his Frankfurt side came together to make a cameo appearance in the video for German band Heldmaschine’s song ‘Wer einmal lügt’, and Colin explains how the backstory saw football and music in wonderful harmony. “Heldmaschine had a hit called ‘Weiter’ (‘Keep Going’) and we had this as our goal jingle last year at the biggest indoor 5-a-side. We ended up scoring the most goals which meant our song was played the most. Despite that link-up, the hard rock tones of acts like Heldmaschine generally don’t make it to teams’ changing room playlists, as much as Colin hoped there would be a day his Frankfurt players would surprise him with one of his favourites! Although there may be a difference in preferences when it comes to genres, Colin certainly had his Frankfurt charges playing to his tune. He has absorbed a huge amount from the coaches he has played under and worked alongside, from the effective taskmaster approach of his first boss at Leicester, Jock Wallace, to the intricate tactical nous of Mannheim’s Uwe Rapolder he paid great attention to and has gone on to implement for years. Back in October, he was one of five British-born nominees on the original ten-strong FIFA World Coach of the Year shortlist, alongside USA’s Jill Ellis, England’s Mark Sampson, Seattle Reign’s Laura Harvey, and Canada’s John Herdman. With a post-playing career which began at TuS Koblenz in 1989, hearing his name had been included on the list was an enjoyable moment. “I was obviously very pleased to be nominated. I’ve been coaching now for 26 years and had plenty of ups and downs in that time. As touched upon, Colin’s time working at 1. FSV Mainz 05 coincided with current Liverpool boss Jürgen Klopp‘s spell in charge. Like the ex-Borussia Dortmund boss, Colin also represented Mainz as a player and he identifies it as a special club to him. While in charge of the Under-23s, he qualified the team for the national cup, the DFB-Pokal, four times – a record for a German amateur side. There was another record four for Colin while at Frankfurt; as the Champions League glory he masterminded made the club the most successful in European women’s football’s premier competition. Frankfurt’s previous three titles (2002, 2006 and 2008) had come in the UEFA Women’s Cup era, and one of the key contributors to this first Champions League crown was Célia Šašić, whose father-in-law, Milan Šašić, was Koblenz boss when Colin came in and headed the youth setup. The striker had played for Colin at Bad Neuenahr before signing to work with him again at Frankfurt in 2013, where she would play out her club career. Named the UEFA Best Women’s Player in Europe, she hit six goals at last summer’s FIFA World Cup in Canada, having also top-scored in the Frauen-Bundesliga (for the second year in a row) and Champions League in an outstanding campaign. Following the World Cup, the German international called time on her career somewhat surprisingly at 27 to concentrate on her studies, start a family, and have a new direction in her life. She had scored 63 goals in 111 games for Germany and along with the United States’ Carli Lloyd and Japan’s Aya Miyama she was named in the final three for the FIFA World Player of the Year award. Colin describes the connection he shared with her and also makes reference to the difficulty in replacing her in the early months of the 2015/16 season. “We worked together for four years and saw each other pretty much every day in that time. We had our ups and downs; we were able to argue with each other at times and still maintain a close, open and honest relationship. “She definitely improved her game in that time and we certainly missed her quality. She’s got her own head on her shoulders, she sticks to her decisions and we respected that. During 2015, Šašić was a music/football interview subject on here, as was current Frankfurt midfielder and Canada international Sophie Schmidt. Šašić described connecting special times with music and how she could produce an album of her life, which is a sentiment Colin can undoubtedly agree with as he recalls his first single and album. “This is an easy one – it was when I was a kid and it was David Bowie ‘Life on Mars’ on seven-inch vinyl. My first album, I won it on Radio Leicester when I was nine or ten and it was Sutherland Brothers and Quiver. Seeing art and emotion come to life by way of live music shows can be amazing to behold. It is a celebration of a band or artist you love, or perhaps the joy is in the person or people you share the experience with. As Colin picks out two shows from his days back home, he also reveals an especially meaningful meeting with friend Gary Numan, an artist known for songs like the UK number ones ‘Cars’ and ‘Are ‘Friends’ Electric?’ (with his former band Tubeway Army) and whose career is into its fifth decade. “One of my all-time favourites was when I saw the Ramones at De Montfort Hall in Leicester in 1980 and I was in awe of how fast they played. I also saw The Cure before they were big and they were supporting Siouxsie and the Banshees. A keen cinema-goer, Colin has a liking for The English Theatre Frankfurt, but with music there are occasions when he’s one of the performers rather than an audience member, and he manages to incorporate it into the off-field side of his team-building. “We did karaoke quite often at Frankfurt and we had an evening of it when we were in our training camp in Turkey last year. The girls enjoy it and I like to sing as well, so the hotel put it on. One of the regular questions on here in recent years has focused upon who the players would choose to record a song cover with, if given the option of any of their career teammates. Has Colin ever worked alongside a player or staff member who would be worthy of joining him in the studio should that situation ever arise?! “At Bad Neuenahr, we were at our Christmas party in 2012 and Rachel Rinast, who played for Switzerland in the World Cup, sang. I’d never heard her sing before and she was just fantastic. “Jackie Groenen at Frankfurt has also got a great voice but is often too shy to sing. It’s difficult because of all the hidden talents; a lot of the players I’ve coached, even in the men’s game, could be talented singers but they keep it to themselves. Among the additional interests that form part of what makes Colin such an interesting subject is taekwondo, which he still trains in by himself when time doesn’t allow him to practice regularly with his club. The first English recipient of the Diplom-Fußball-Lehrer from Cologne College of Physical Education, he also has a Diploma in Biblical Studies and has preached in England, Romania, Austria, the U.S. and all around Germany, which he mentions as he details some more of how his time is spent outside of football. Varied hobbies and endeavours allow you to meet people from all kinds of backgrounds, some of whom manage to strike a real chord with you and stir inspiration. When asked about players who have made the strongest positive impressions on him, it understandably wasn’t easy for Colin given his comprehensive coaching history, but a certain Welsh midfielder who made a huge contribution to Frankfurt’s success last season while on loan from Seattle Reign came to mind. “Tough one because there’s been so many over the years. To go with a recent one, it was a joy to work with Jess Fishlock; she’s a fantastic girl and the most complete player in women’s football I’ve worked with. An effervescent character and a player who has so often produced superb midfield displays, Fishlock appeared in both legs of Frankfurt’s Champions League quarter-final win (12-0 on aggregate) over her former club Bristol Academy in March before returning to Seattle for the start of the National Women’s Soccer League (NWSL) season. She featured in an in-depth interview on this site in March 2014 and has gone on to further prove her credentials as one of the NWSL’s leading creative outlets. During recent months, she has been player/assistant coach at Melbourne City in Australia’s W-League and helped the side to the regular season title, with the Finals still to come. Aside from her play, Colin was extremely impressed by how much of a student of the game his former number 28 was, and is intrigued as to where her future in the game will eventually take her. In what made for compelling following for the neutral, last season’s Frauen-Bundesliga title race went to the wire, with Frankfurt finishing third behind runners-up Wolfsburg and winners Bayern Munich. Those two sides are examples of women’s teams linked to men’s clubs, and such affiliations are seen dotted around various countries, so does Colin see the benefits of such arrangements outweighing the drawbacks? “If the men’s clubs take it seriously and it’s not just a fad for a couple of years then it can be a very good thing because of the clout the men’s teams have. If you see there’s a market for the women’s game and don’t compare it to the men’s – because it’s a game in itself and you really can’t treat it as the same – then the sport on its own can stand up for itself. “There are a lot of good things: the girls can use the facilities, play in a good stadium, they can have the TV coverage and the marketing, which needs to be done right. I also think it’s important that the teams who aren’t affiliated with a men’s club, like Turbine Potsdam for example, don’t go bust. As Liverpool won the FA Women’s Super League (FA WSL) in 2013 and 2014, two German players were part of the successes – defender Corina Schröder and midfielder Nicole Rolser. Their coach at Bad Neuenahr before their move to England, Colin took a keen interest in how they and the Reds got on after that, and he offers his thoughts on the league from afar. “They’ve got a structure in the WSL and I hope it’s constant through the league. We’re all keeping an eye on how it’s going and we see that clubs like Manchester City and Chelsea are investing. Ahead of his departure, Colin had guided Frankfurt through to the Champions League quarter-final after a shootout win over LSK Kvinner in the second leg in Norway. The Toppserien champions will of course be one of the sides he will be battling it out with this year with Avaldsnes, who begin their Champions League adventure in the 2016/17 campaign. Liverpool legend Bill Shankly, Manchester City great Malcolm Allison, and Nottingham Forest and Derby County icon Brian Clough were early managerial inspirations for Colin. His namesake – the hugely-revered former Man City midfielder – was champion of England in 1968 after Allison had been instrumental in bringing him to the club to play for him and manager Joe Mercer. As a kid, Colin waited with his mother after the game when City came to play Leicester at Filbert Street so he could meet ‘the other Colin Bell’. When it looked like it wasn’t going to happen, Colin convinced his mum to wait a bit longer, but he had to run through a gap unintentionally left by a policeman and onto the City bus to get the autograph, as the England man had luckily been sitting near the front! Just like his hero in that story used to ensure, Colin likes people in the stadium to be entertained; he wants control through his team’s possession, but always with an attacking purpose. His return to England for Frankfurt’s game at Bristol’s Ashton Gate last March was the first chance for his sisters to see one of his sides play in person, so although Avaldsnes is the here and now, could we one day see him lead a team back home? “You never know; I’m open to see where my journey takes me. It could be an exciting possibility one day if a club’s ambition is right. Prior to his move to Germany as a player with VfL Hamm, Colin had offers from New Zealand, Australia and Finland, proving just how one decision can shape the years and decades that follow. That has so far also rang true with regard to his time in the women’s game, and he thinks it can reach a higher pace as it further develops technically. Five years after he first committed to coaching in women’s football, Colin shares his feelings on what it has taught him the most. “One of the biggest things I’ve learned is about when you’re interacting with the girls. I was quite an aggressive player and you have to be careful about how passionate and emotional you can be in these situations. Music and football are the two themes of this site, and they are always in the starting line-up in Colin’s life. With that in mind, let’s close with a fantasy scenario – at this point at least – to spectacularly bring them together. The scene is a league title success for Colin, secured in front of his home supporters, with a set of music performers to play live in the stadium after the trophy presentation. He gets to decide who would be invited to perform, so who would headline this very special mini-festival?